I was wondering if the new Oracle Database 12c version 12.1.0.2.0 in-memory column store feature will SLOW performance when it is NOT being used. I think this is a fair question because most Oracle Database systems will NOT be using this feature. While the new in-memory column store feature is awesome and significant, with each new Oracle feature there is additional kernel code. And if Oracle is not extremely careful, these new lines of Oracle kernel code can slow down the core of Oracle processing, that is, buffer processing in Oracle's buffer cache. Look at it this way, if a new Oracle release requires 100 more lines of kernel code to be executed to process a single buffer, that will be reflected in how many buffers Oracle can process per second. 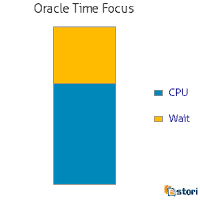 To put bluntly, this article is the result of my research comparing core buffer processing rates between Oracle Database versions 11.2.0.2.0, 12.1.0.1.0 and 12.1.0.2.0. With postings like this, it is very important for everyone to understand the results I publish are based on a very specific and targeted test and not on a real production load. Do not use my results in making a "should I upgrade decision." That would be stupid and an inappropriate use of the my experimental results. 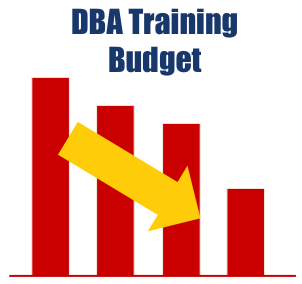 But because I publish every aspect of my experiment and it is easily reproducable it is valid data point with which to have a discussion and also highlight various situations that DBAs need to know about. There are two interesting results from this research project. This article is about the first discovery and my next article will focus on the second. The second is by far the most interesting! FYI. Back in August of 2013 performed a similar experiment where I compared Oracle database versions 11.2.0.2.0 with 12.1.0.1.0. I posted the article HERE. For this experiment when I say "faster" I am referring to raw buffered block processing. When a buffer is touched in the buffer cache it is sometimes called a buffer get or a logical IO. But regardless of the name, every buffer get increases the instance statistic, session logical reads. I like raw logical IO processing experiments because they are central to all Oracle Database processing. Plus with each new Oracle release, as additional functionality is inserted it is likely more lines of Oracle kernel code will exist. To maintain performance with added functionality is an incredible feat. It's more likely the core buffer processing will be slower because of the new features. Is this case with Oracle's in-memory column store? I have included all the detailed output, scripts, R commands and output, data plots and more in the Analysis Pack that can be downloaded HERE. There are a lot of ways I could have run this experiment. But two key items must exist for a fare comparison. First, all the processing must be in cache. There can be no physical read activity. Second, the same SQL must be run during the experiment and have the same execution plan. This implies the Oracle 12c column store will NOT be used. A different execution plan is considered "cheating" as a bad plan will clearly loose. Again, this is a very targeted and specific experiment. To make this easier for myself, to perform the test I used my CPU Speed Test tool (version 1i). I blogged about this last month HERE. The latest version of this tool can be downloaded HERE. Shown below are the experimental results. Remember, the statistic I'm measuring is buffer gets per millisecond. Details about the above table: The "Normal" column is about if the statistical distribution of the 31 samples is normal. If the p-value (far right column) is greater than 0.05 then I'll say they are normal. In all three cases, the p-value is less than 0.05. If fact, if you look at the histograms contained in the Analysis Pack every histogram is visually clearly not normal. As you would expect the "Average" and the "Median" are the statistical mean and median. The "Max" is the largest value in the sample set. 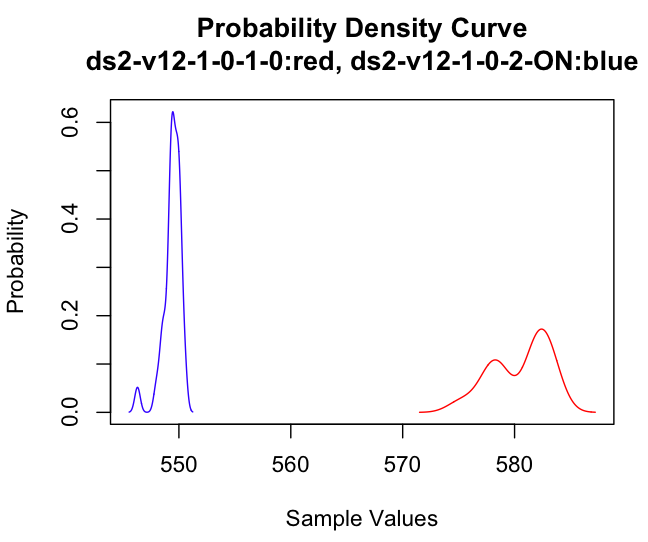 The "Std Dev" is the standard deviation, which is doesn't mean much since our sample sets are not normally distributed. 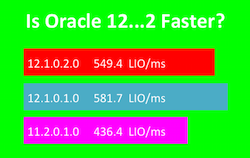 As I blogged about before the Oracle Database 12c buffer processing is faster than Oracle Database 11g. However, the interesting part is Oracle version with in-memory column store 12.1.0.2.0 is slower then the previous version of 12c, 12.1.0.1.0. In fact, in my experiment the in-memory column store version is around 5.5% slower! This means version 12.1.0.1.0 "out of the box" can process logical buffers around 5.5% faster! Interesting. In case you're wondering, I used the default out-of-the-box in-memory column store settings for version 12.1.0.2.0. I checked the in-memory size parameter, inmemory_size and it was indeed set to zero. Also, when I startup the Oracle instance there is no mention of the in-memory column store. As an important side bar, I did statistically compare the Oracle Database versions. Why? Because while a 5.5% decrease in buffer throughput may seem important, it may not be statistically significant, meaning this difference can not be explained with our sample sets. So going around saying version 12.1.0.2.0 is "slower" by 5.5% would be misleading. But in my experiment, it would NOT be misleading because the differences in buffer processing are statistically significant. The relevant experimental details are shown below. In all three cases the p-value was less than 0.05 signifying the two sample sets are statistically different. Again, all the details are in the Analysis Pack. The chart above shows the histograms of both Oracle Database 12c version sample sets together. Visually they look very separated and different with no data crossover. So from both a numeric and visual perspective there is a real difference between 12.1.0.1.0 and 12.1.0.2.0. To me this is surprising. First, there is a clear buffer processing gain upgrading from Oracle 11g to 12c. That is awesome news! But I was not expecting a statistically significant 5.5% buffer processing decrease upgrading to the more recent 12.1.0.2.0 version. Second, this has caused me to do a little digging to perhaps understand the performance decrease. The results of my experimental journey are really interesting...I think more interesting than this posting! But I'll save the details for my next article. Remember, if you have any questions or concerns about my experiment you can run the experiment yourself. Plus all the details of my experiment are included in the Analysis Pack. All the best in your Oracle performance tuning work!